Yet another orange, western North American Lactarius requiring microscopic analysis for identification, Lactarius subflammeus associates with conifers and features white, unchanging milk and an acrid taste. 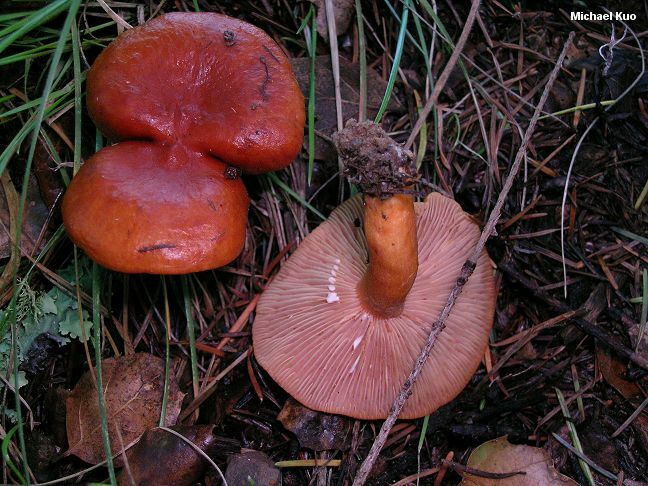 Its pileipellis is an ixotrichoderm (separating it from Lactarius rufus, which has a non-gelatinized cutis) arising from a layer of somewhat inflated cells (separating it from Lactarius luculentus var. 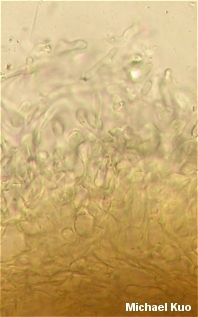 laetus, which has a trichoderm that arises from a layer of interwoven filamentous hyphae). Ecology: Mycorrhizal with various western conifers; summer and fall in the Rocky Mountains; fall and winter on the West Coast; reported from the Rocky Mountains, the Pacific Northwest, and California. Cap: 2-7 cm; broadly convex, becoming flat, shallowly depressed or shallowly vase-shaped; thinly slimy when fresh; bald; scarlet when very young, but soon orange; evenly colored to the margin; without zones of color; the margin sometimes slightly lined at maturity. 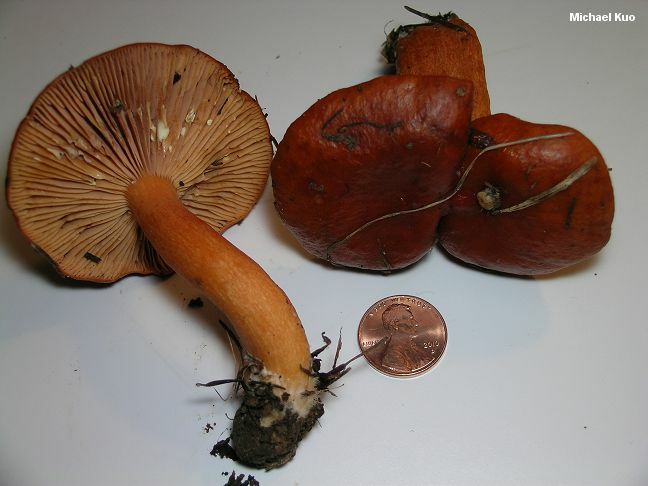 Gills: Attached to the stem or beginning to run down it; close or, at maturity, nearly distant; whitish when very young, but soon pale orange and eventually colored more or less like the cap; not bruising or staining. Stem: 2-10 cm long; up to 1.5 cm thick; becoming hollow; more or less equal; dry; without potholes; colored like the cap, but paler. Flesh: Whitish to pinkish or orangish; not changing when sliced. Milk: White; unchanging; not staining tissues. Odor and Taste: Odor slightly fragrant, or not distinctive; taste acrid (sometimes slowly so). 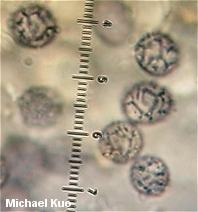 Microscopic Features: Spores 7-9 x 6-7.5 µ; broadly ellipsoid; ornamentation 0.5-1 µ high, as amyloid warts and ridges that form a few branching patterns but do not form reticula. Pleuromacrocystidia scattered to abundant; conspicuous; subcylindric to subfusiform; 50-100 x 6-10 µ. Cheilocystidia similar; to about 50 µ long. Pileipellis a turf-like ixotrichoderm arising from a layer of somewhat inflated, isodiametric elements. REFERENCES: Hesler & Smith, 1979. (Arora, 1986; Phillips, 1991; Methven, 1997; Trudell & Ammirati, 2009.) Herb. Kuo 01141106.